This big tent is with size of 12m x 9m for body part, the wall is 0.5m thick. It is with 3 entrances which one in front, two are in opposite side. 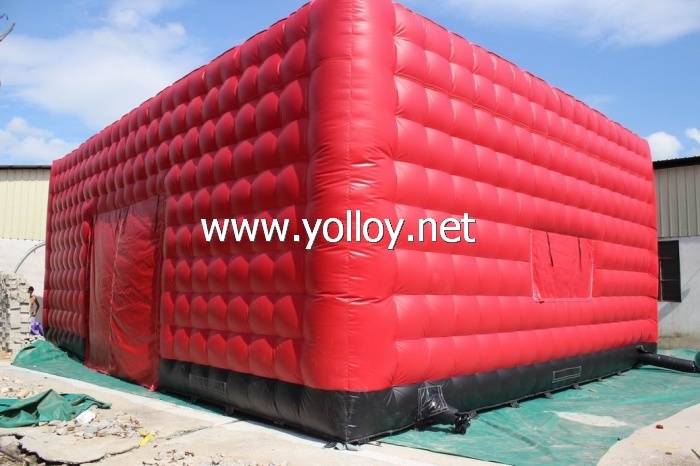 It is usually used as party tent, concert tent, movie projection tent or event solution for temporary cover and so on. This tent need space at least 15m x 12m. The inner space is about 88 sq meter, it is suitable for about 88 seats for dinner and about 160 person for party or concert. If other events, depend on the arrangement. And if do not have so much space, we can shorter or delete the tunnel entry to increase the space using rate. Except the cube shape party tent, we also have many other party solutions such as dome tent, spider tent, tunnel tent and so on. You are welcome to contact us for more information.